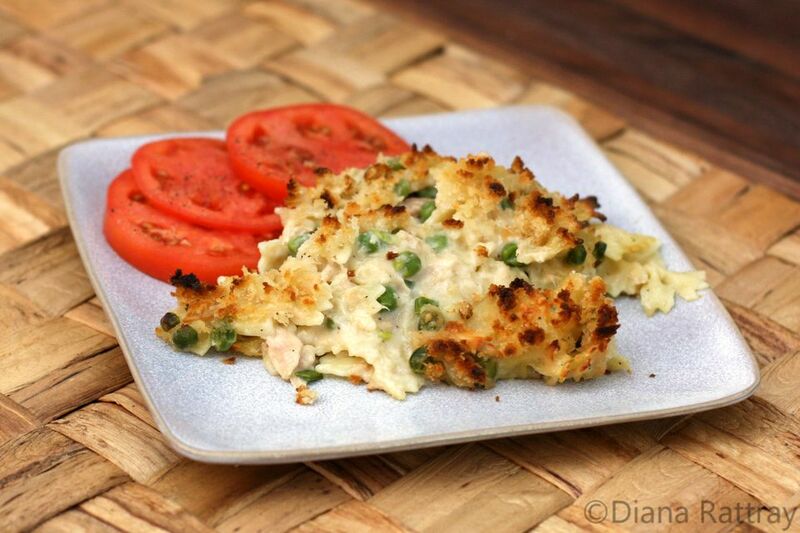 Parmesan cheese and a small amount of sherry add flavor and richness to the sauce for this everyday tuna casserole. Serve this easy meal with fresh sliced tomatoes for an easy and delicious family meal. You may leave the sherry out if you prefer to cook without alcohol. Feel free to change the pasta shape to medium or wide egg noodles, macaroni, rigatoni, or another shape. Grease a 2 1/2-quart baking dish. Cook pasta in boiling salted water following package directions; transfer to a colander to drain. Rinse with hot water and set aside. In a medium saucepan, melt butter over medium-low heat. Cook green onions and garlic for about 1 minute. Add flour and stir until blended and bubbly. Add the milk and chicken broth and cook, stirring, until thickened. Add 1 cup of the Parmesan cheese, sherry, pepper, and nutmeg. Stir in the tuna and peas, stir in the drained pasta, then taste and add salt, as needed. Transfer the mixture to the prepared baking dish and sprinkle the remaining 1/4 cup of Parmesan cheese over the top. Toss bread crumbs with the melted butter until well blended and sprinkle the crumbs over the Parmesan layer. Bake the casserole for 25 minutes, or until browned and bubbly.